Nothing seems to be more rewarding than the sight of a hummingbird. Even the most raucous group of gardeners, sitting around a table, enjoying their wine (or tea), discussing the hardships caused by this season’s weather, each more loudly than the other because it’s been more difficult for them, will fall silent as a hummingbird buzzes by and stops for a drink at the feeder. Once a hummingbird finds a home that they enjoy, they will often return each year. I have one that lives in the cedars by the parking area and frequently visits the trial bed. The trial bed is supposed to be a place to try out new perennials for hardiness and to see if they live up to their claims, but as my friend becomes attached to certain plants, there are fewer holes for new plants to be tried because I don’t want to move them. The new Agastache that went in last year, and that I never expected to live through the winter, will probably never leave. Attracting hummingbirds to your garden is easier than you might think. A feeder is a good place to start as it provides food all summer. You can buy hummingbird food that you mix with water or you can make your own. Boil 1 cup of regular white sugar with 4 cups of water for 2-3 minutes. Once it has cooled completely, it can be used in your feeder. The extra nectar can be stored in your refrigerator for up to 2 weeks. Remember to clean your feeder often. Twice a week is best and you just have to rinse it with hot water. Use pipe cleaner if you see any black mould. If you do use soap, be sure to rinse it thoroughly before refilling your feeder. Many people take their feeder down in the early fall when it starts to get a little colder, but the Rufous Hummingbird will often stick around until December, and would definitely appreciate some help when flowers are becoming more scarce. A well-planted garden will reduce or even eliminate your dependence on the feeder. The more variety of plants you have, the longer the bloom time. Staring with early blooms like the native columbines, you can keep your hummingbirds fed and happy right up until frost. If you check out the many websites about hummingbirds, many will tell you to plant only native plants for the hummingbirds. I’ve just rolled my eyes in such an exaggerated manner that would rival the most sullen teenager. My apologies to the teens reading this who are probably rolling their eyes right now. Many native plants are great, but adding non-natives and hybrids will extend your bloom time and that’s all the hummingbirds care about. I’ll get into native plants at a later time. Hummingbirds, like butterflies, see in the orange-red spectrum. This doesn’t mean that they’ll only feed at red and orange flowers, just that they’ll go to them first. They also prefer tubular flowers. This allows them to get to nectar that many insects leave behind. Monarda (bee balm) is an absolute must. It has a long bloom time and will provide them with necessary food for more than a month. Jacob Cline, with it’s large red flowers is a particular favourite of mine (and the hummingbirds) but there are many other red varieties, as well as pinks and purples and less-commonly white. Bee balm is also easy to use in the garden because it is both drought-tolerant and will grow in moist conditions. 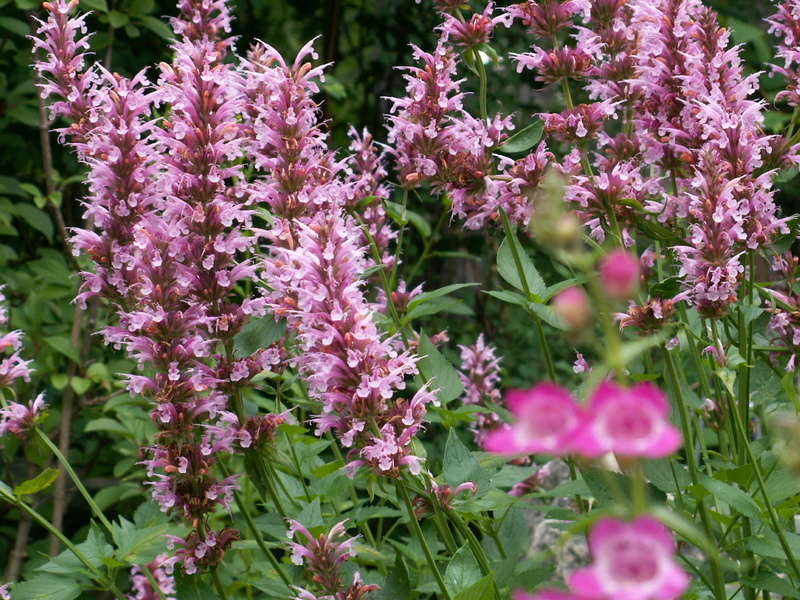 Agastache (hyssop) is another very-long blooming perennial that will make them very happy. Traditionally, the blues (that’s really light purple to you non-gardeners) were the only hyssops that were hardy, but recent hybridization has come up with pinks and reds to add to your collection. Cotton Candy, Summer Love and Summer Glow were added to the trial bed last year and all have come through the winter very nicely. Summer Glow is the first yellow that has lived for me and Cotton Candy is the one my friend loves and has been blooming for more than a month with no signs of slowing down. I could fill a page with plants that hummingbirds like, but I think I’m running out of space so I’ll mention a few perennials and shrubs that also have great garden merit; lupins, penstemons, butterfly bush, hostas (yes, hostas), honeysuckle, coral bells (especially the old fashioned green-leaved red-flowering kind), weigela, hollyhock, cardinal flower, turtlehead, joe pye weed, hibiscus and cup plant. There are plenty of annuals and tropicals as well. These can help fill in the flowering gaps, which is very handy if you don’t have massive gardens (or a garden centre out of your home). Fuschia, cigar plant, salvia, lantana, four-o-clocks, mandevilla and hibiscus are just a few examples.